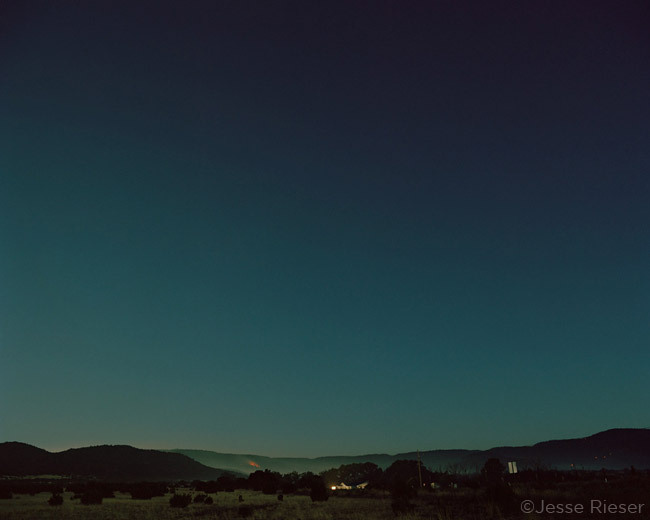 Jesse Rieser formally announced his latest series, The Wallow Fire. 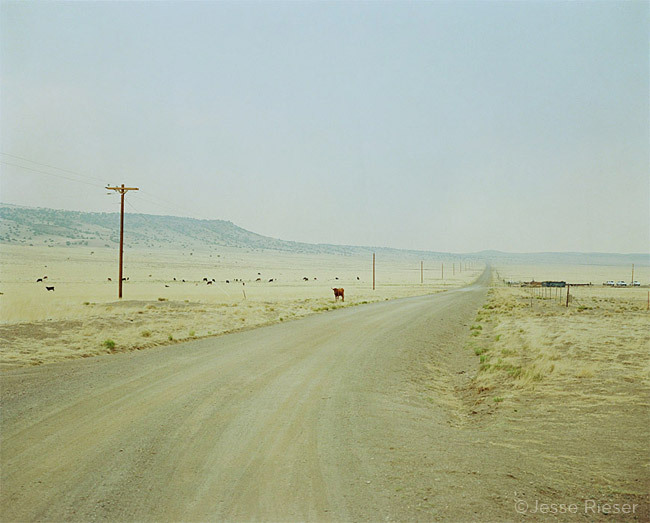 In Eastern Arizona, near the border with New Mexico, is a land of dirt roads stretching out to white-washed horizons. Here, ranches are carved out of the scrub- and pine-dotted landscapes and grazing cattle are the only living things for miles. The area’s beauty comes from its pervasive remoteness. But from late May to early June in 2011, the land in and surrounding the Bear Wallow Wilderness Area in the White Mountains was remade with a terrible, devastating kind of beauty. One that turned the landscape lunar and the air yellowed and hazy. A campfire sparked a conflagration that charred 841 miles across Arizona and New Mexico, destroying 72 buildings, 32 of them homes. 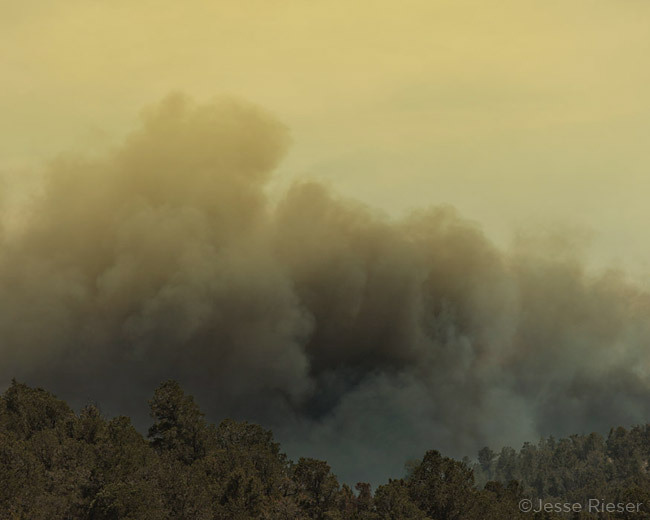 Driving west from Santa Fe in late May 2011, I saw the Wallow Fire, as it was named, and I was mesmerized by the towering smoke plumes and expanses of blackened earth. 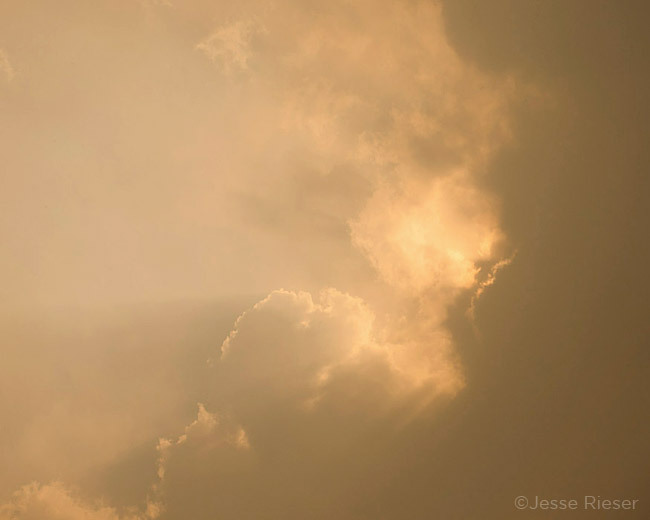 I returned a week later for five days to capture the fire, its effects, and the international community of men and women assembled to fight and eventually extinguish the blaze. 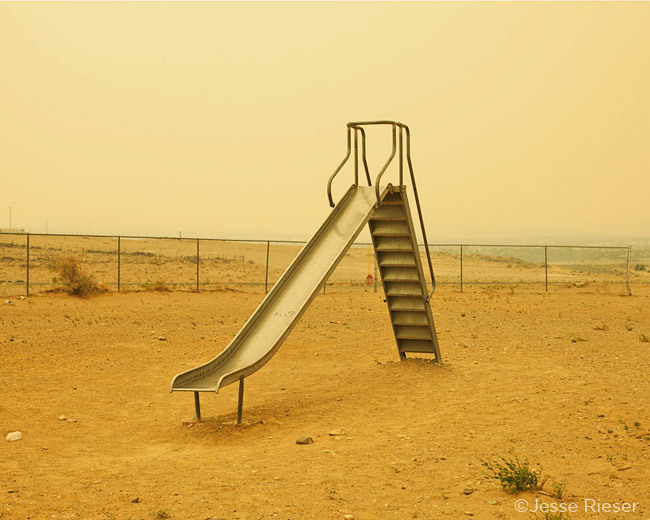 I was drawn by the way the Wallow Fire, reshaped the landscape and the atmosphere, making it a surreal, deadly place where playgrounds stood empty, where tree bark turned to ash scales, where grazing land was charred to cinder, where the air swirled thick with smoke and heat. Forcing everyone to evacuate. 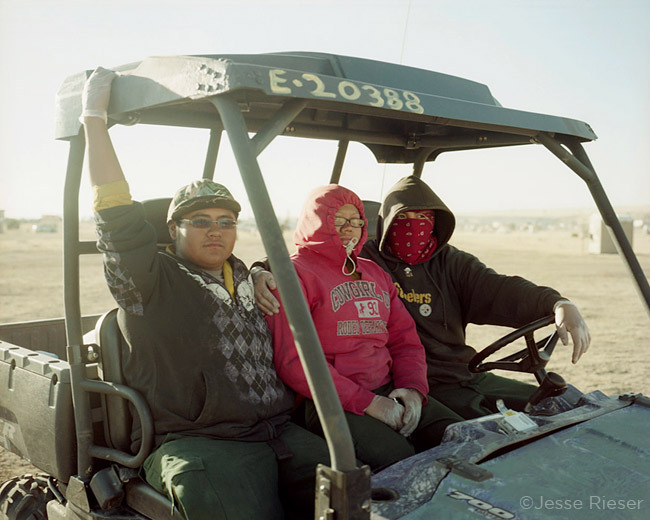 Most of my work deals with subjects close to me, familiar in nature and often very personal. This project was different. 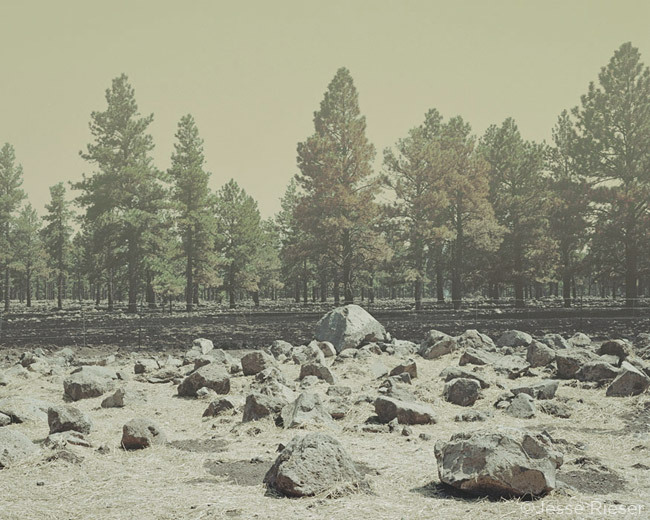 Growing up in the Midwest, I had never experienced a forest fire, let alone one as massive and overwhelming as the largest fire in Arizona history. In a sense, I was a tourist, fascinated by everything that unfolded and recording everything I saw. There were no plans, no preconceived notions. 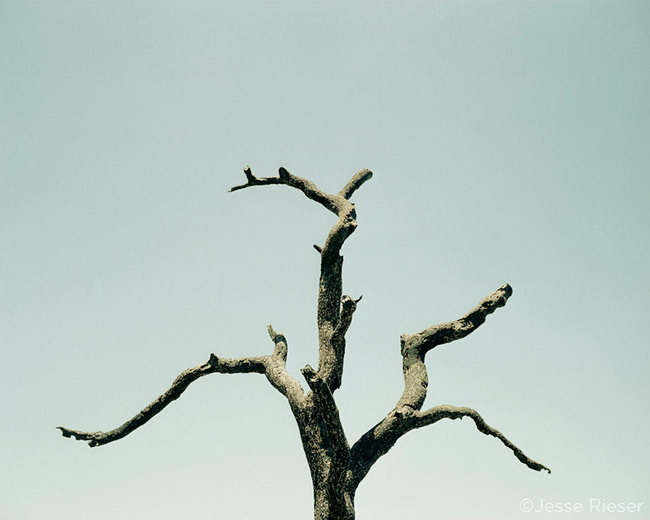 To see more of Jesse Rieser’s work go to his website or Altpick page. 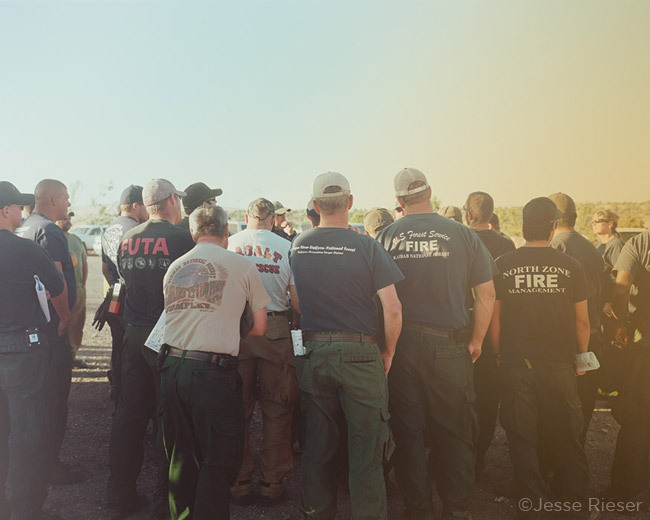 This entry was posted in Uncategorized and tagged Arizona, Bear Wallow Wilderness Area, New Mexico, Santa Fe, The Wallow Fire, The White Mountains, Wallow Fire. Bookmark the permalink.